What did the fourth estate say about WWIII? Wheels and Wings Tenth Anniversary Bicycle Ride Starts and Finishes at our club’s favorite spot, Beef O’ Bradys in historic and beautiful Punta Gorda, FL. The Event features Jersey (pre registered by June 1st), Ten Wings, two Beerveridges, four different rides: 15/32/50/62 and on July 13th bring your off road bike for a 40 mile Gravel Grinder for those looking for something a little different. There will be our famous Speed Trap Alley hosted by our own Punta Gorda Police Department, break the posted speed limit as measured by radar and receive a Speed Warning Ticket suitable for framing on your brag wall. Breakfast (juice, coffee and pastry), sag stops and more! A great photo opportunity that you won’t want to miss. 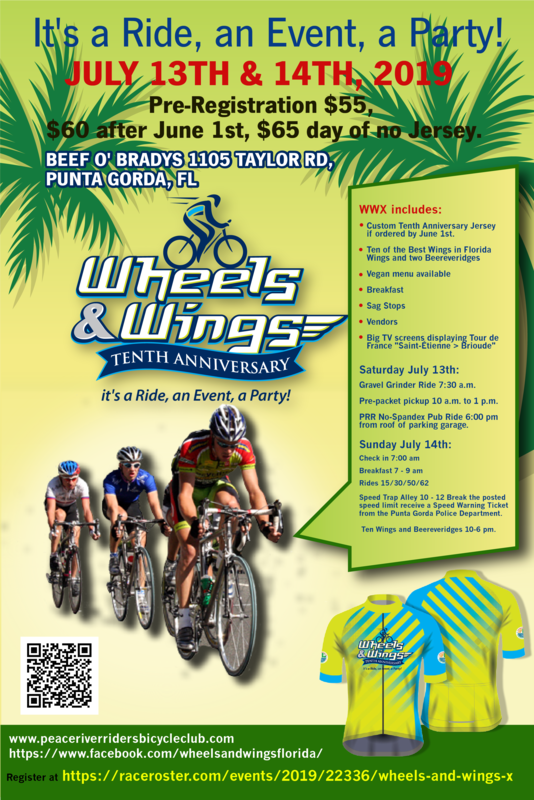 Wheels and Wings Tenth Anniversary, it’s a Ride, an Event, a Party! See you July 14th. Saturday July 13th, Gravel Grinder starts at 7:30. Check in and Registration opens at 7:00 a.m.
Club’s No Spandex Pub Ride 5:30 Saturday night. Main Event: July 14th, Beef O’ Bradys, 1105 Taylor Rd, Punta Gorda. Check in 7 a.m., Rides leave after 7:30 a.m. Speed Trap Alley starts at 10 a.m. to 12:00 Wings served from 10:30 a.m. 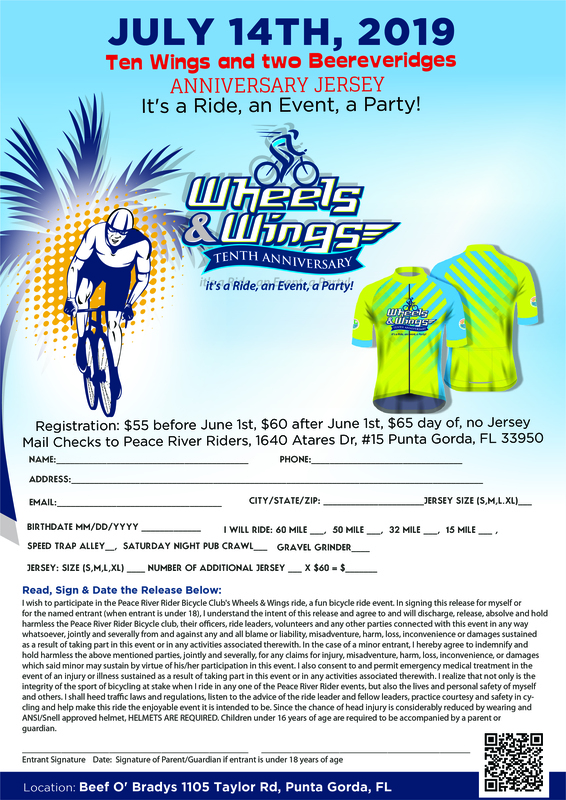 Check our Facebook page, https://www.facebook.com/wheelsandwingsflorida for up to the minute updates. Or the Peace River Riders Webpage for more information. Parking will be at various locations near Beef O’ Bradys, club members will direct you to parking areas. Ride starts will be staggered, Check the website and Facebook for details as they develop. More as it firms up. 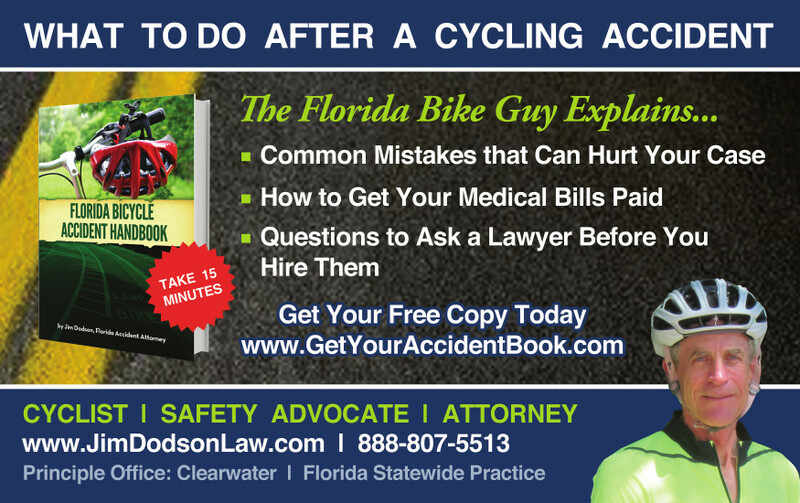 PRRBC Grant Program for Bicycle Advocacy.